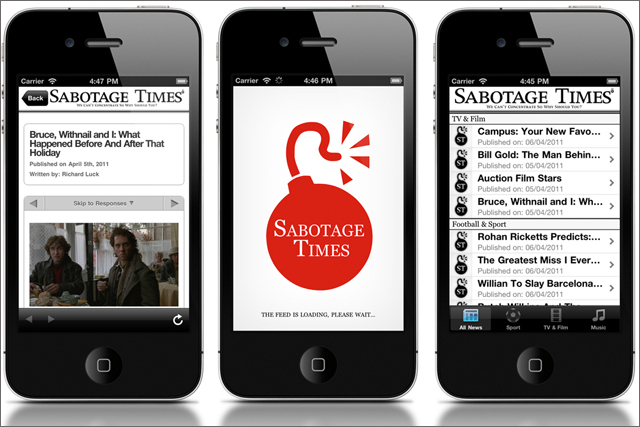 Sabotage Times, the online venture launched by Loaded founder and former editor James Brown, has launched a free app for iPhone and Android built by creative agency Dare. The app, like the Sabotage Times' website, carries articles about football, fashion, sport, opinion, relationships, drink and film from a network of contributors. The company sells content to titles, brands and companies across the world and has sold 200 stories to 30 different companies, mainly publishers, according to Brown. Dare's previous work with Stephen Fry impressed Brown, who said his relationship with the agency began when he met executive creative director Danny Brooke-Taylor at a Panini football night. Brown said: "If this goes well we will be looking at doing something down the line that we could charge for." Sabotage Times is also working on a project based around the forthcoming Euro 2012 football tournament, and Brown hopes to find sponsorship for the activity. Sabotage Times' ad sales are handled by Woot and advertisers have included Umbro, Paul Smith, BBC 6 Music and Panasonic. Brown said he hasn't yet discussed whether the app will carry ads.